Time really flies! I was thinking about my previous visit to Bushy Park during the rut, and when searching for the blog found it was two years ago, not last year as I originally thought! 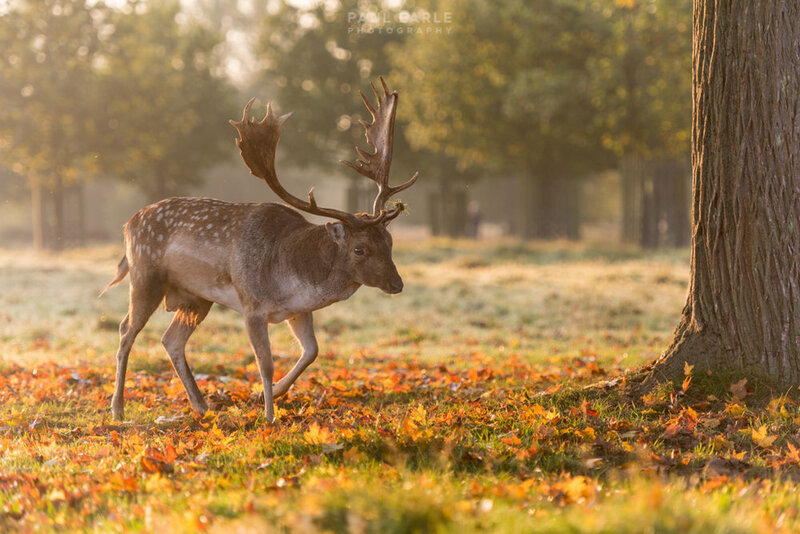 - see Bushy Park rutting season. Well, it was that time of the year again, and having been watching the weather closely for a few weeks, finally this Sunday morning promised to be sunny with clear skies. With the unusually warm temperatures for October there was less likelihood of the misty spectacle that I had back in 2015, but I set off before sunrise into London in anticipation of what lie ahead! I arrived to the car park in the dark, with dozens of cars and other photographers already there, much more than my previous visit. I promptly headed off to track down where the action was occurring. There was very little rutting going on, but plenty of bellowing from various quarters of the park. The cherry on the top of the cake for me was when one particular area of the park nearby that was transformed as the sun caused mist to rise from the damp ground. It created a truly superb atmosphere and some great photo opportunities. There was one moment which was an 'interesting' encounter with a buck, where I was trying to capture the sunlight behind him. He seemed to be completely unfazed by me taking the photos as he approached me while I kept running backwards to get the right positioning for the shot! Here's a few more from the sequence of trying to capture the photo I had in my mind. With a few hundred photos already taken, I checked the time and was surprised to find it was only 8.17am, less than an hour after sunrise and I realised it was good timing to start walking back to the car and get back home to the family and in time for our morning Church service. A few more opportunities crossed my path as I made my way back to the car park! And that was going to be the last of the sun for a few hours as I noticed a bank of cloud blowing in from the west, wiping out golden hour colours, and concluding a fantastic ~1.5 hours of photography.